(Charlottetown, P.E.I.) – Canadians are once again getting set to celebrate Culture Days and Confederation Centre is getting in on the fun. Culture Days is a three-day nation-wide celebration of arts and culture, hosted by local arts groups and municipalities. Victorian Games with the Confederation Players (1-3 p.m.) – Grab a mallet or a horseshoe and join the Confederation Players for a friendly game of croquet or horseshoe toss. Guided tour of Places, Paths, & Pauses exhibition (1-3 p.m.) – Join a guide for a 20-minute interpretation of Newfoundlander Marlene Creates nationally-touring exhibition in the Confederation Centre Art Gallery. dance umbrella Intro Classes – Explore ‘Introduction to Jazz’ (1:30-1:50 p.m.) or ‘Intro to Contemporary’ (2-2:20 p.m.) dance classes with a professional instructor. Classes are targeted for younger dancers (6-13 years of age). Wear comfy clothing; bare feet are fine. “Build Your Own Country” (1:30-2:35 p.m.) – Join a guide or Confederation Player in The Story of Confederation exhibition for this fun and easy activity. Participants are asked to dream up their own nation, draw its coat-of-arms, and create the laws of the land! Button-making in the Gallery (3-4 p.m.) – Imagine, design, and create some wearable art: button pins! Gallery staff will be on hand for this fun activity for children and adults alike. Elementary Musical Theatre (3:30-4:30 p.m.) – Participate in an Elementary Musical Theatre class (for those 8-12 years of age). Wear comfy clothing and enjoy exploring music, dance, and theatre basics alongside dance umbrella students. Signatures: A Canadian Spectacle Under the Stars (10-11 p.m.) – Breathe in some fresh air and experience this visually-stunning video production. Projected on the sandstone walls of the Centre, this show pays homage to Canada’s people, evolution, and natural beauty. Immediately following, enjoy a selection of local films showcasing the talents of PEI’s incredible filmmakers. For more information – or to sign up for the first-come, first-served dance classes – please visit the Culture Days website or contact Ellen Theuerkauf, development and events coordinator, at etheuerkauf@confederationcentre.com. 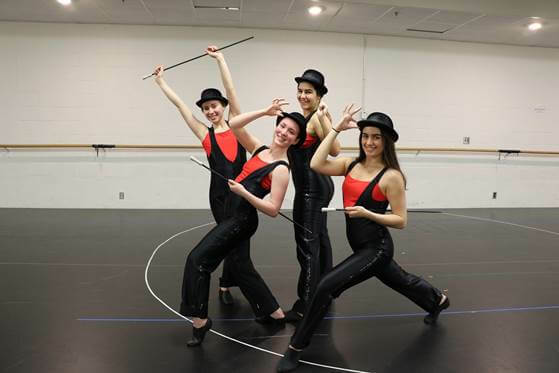 Photo cutline: As part of Culture Days, the public is invited into the Centre on September 29 for a variety of free activities, including ‘Intro to Jazz’ classes with a professional instructor via th Centre’s dance umbrella program (submitted photo).